Wyke massively underestimated a tricky Whinmoor side in their latest Pennine ARL Division One match and, despite scoring some fine tries from set pieces, their defence, energy and composure ultimately let them down. Ryan Kershaw scored three good tries, his third being a nice pick up off Ian Wormald, who also crossed to maintain his try a game record. Calvin Barker, Sam Kitson, Alec Williams and Ben Proctor all crossed but poor one-on-ones and lazy defending lead to Whinmoor clawing themselves back into the match. Star of the show in the 36-36 draw, 16-year-old Proctor. had another 100 per cent record with some tricky touch-line conversions included. Wyke coach Warren Pitman commented: “I was very disappointed with our game management and composure. “We are seemingly learning some lessons the hard way at the minute. “Whinmoor were poor but they weren’t that poor as they were actually unpredictable and dangerous. “You have to give them credit, they came at us and I think by doing that, they were able to catch us cold. 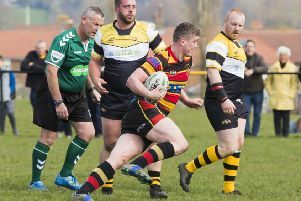 Brighouse Rangers, left without a fixture last weekend, are on the sidelines again this weekend along with all other amateur players due to the Super League Grand Final at Old Trafford (6pm). They would sooner have been in action after three successive Division One defeats which has left them second from bottom. Bradford Bulls and England Women’s centre Amy Hardcastle, who works as a carer in Brighouse, was his side’s sole try scorer against Thatto Heath in last Sunday’s Top Super 6 Grand Final at the Select Security Stadium, Widnes. Amy goes to Avignon on October 22 to play for England against France in a curtain raiser for the men’s international.